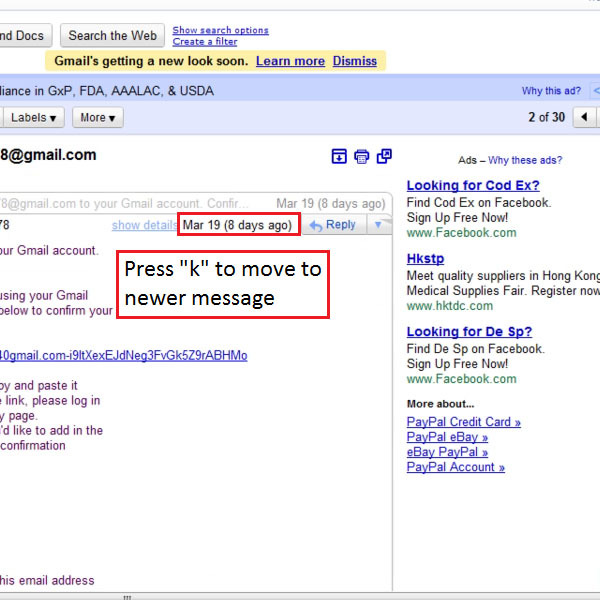 Gmail is one of the largest email service providers in the world. It has many features such as spam control, unlimited storages space, chat, labs etc. It also has an extensive and detailed keyboard shortcuts guide which can provide you the whole list of shortcuts with their respective features. Follow this step by step tutorial to learn How to use keyboard shortcuts to navigate through conversations. You can begin by signing into your Gmail account. 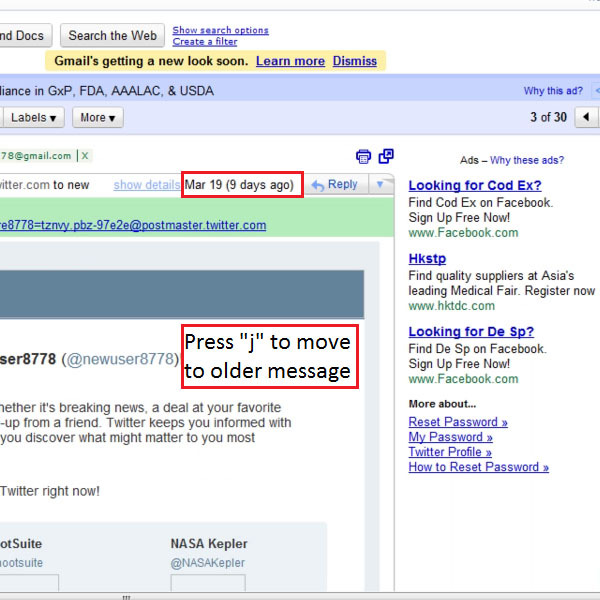 Go to www.gmail.com, type your username and password and click on Sign in. In the main Gmail Inbox page, open any one conversation by clicking on it. To switch the view to a newer conversation, press ‘k’. This will open the newer conversation view. You can now press ‘j’ to move to an older conversation which is next in line. The number of times you press ‘j’ will move you to that many number of older conversations. While browsing through conversations, you can simply press ‘u’ to return to the main Inbox page as shown in the picture. Further in the main page of the Inbox, you can press ‘k’ or ‘j’ to move up or down in the messages respectively. 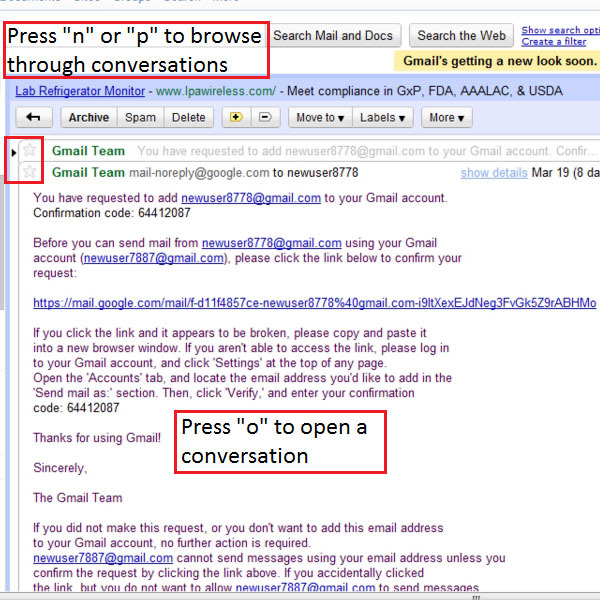 You can press ‘o’ to open a conversation from your Gmail inbox. 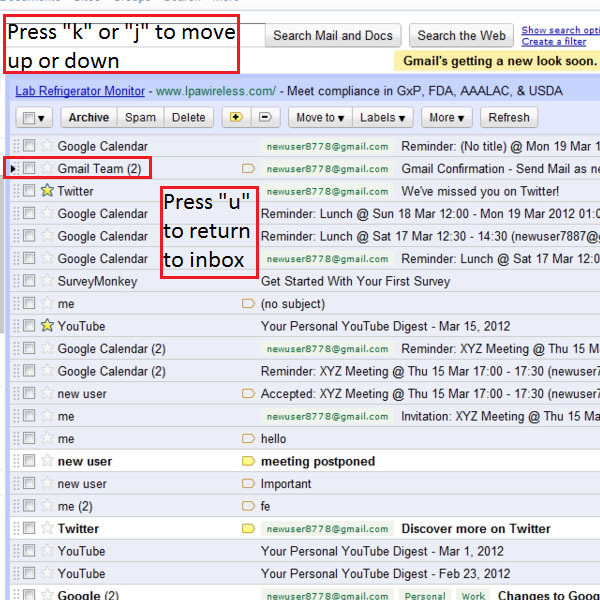 Within the conversation, ‘n’ or ‘p’ to move through conversations in Gmail. 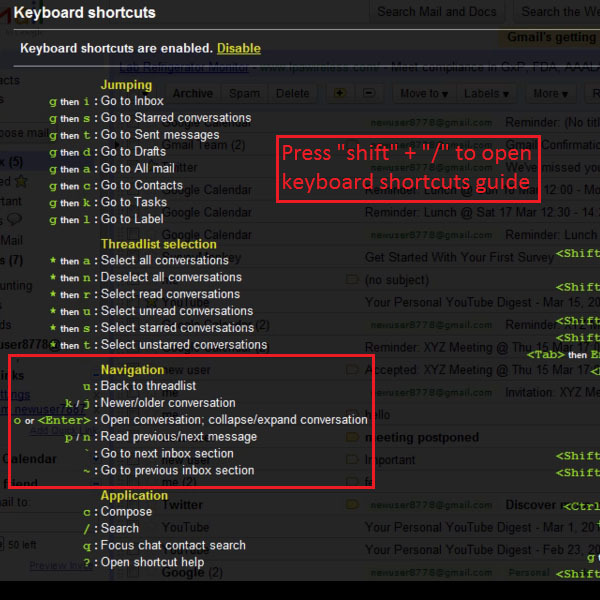 You can also refer to the Keyboard shortcut guide while browsing or navigating through your Gmail conversations. To make this guide appear, press ‘shift’ and ‘forward-slash’ simultaneously.